Extensions can only be used in the full version/paid of the software. You will need an official license! Extensions are only available for registered users! 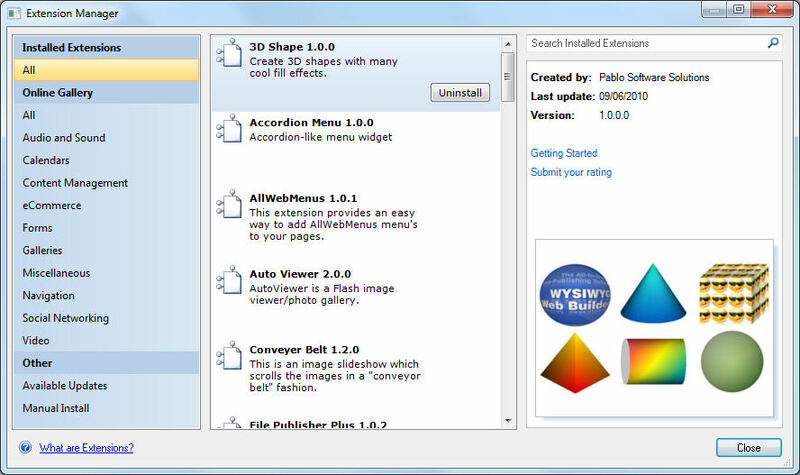 Extensions are not officially supported, they are made available as an extra service for the users of WYSIWYG Web Builder that find them useful and the software is provided "AS IS". They are not an official part of the software! Pablo Software Solutions will not offer support for third party extensions and is in no way responsible for proper functioning of these extensions. Some third party extension developers do offer support! See the dedicated extension section of this forum. The current version of WYSIWYG Web Builder supports a maximum of 200 extensions, this is a limitation in the way Windows loads external processes) Basically each extension is an external process, so loading 200 extensions is like launching 200 applications of your computer. To prevent the application from becoming unstable we had to built-in a maximum for the number of extensions to reserve memory/system resources for other application functionality. But anyway, it is not recommended to install unused extensions because this will take up unnecessary memory and may slow down the application. 1) Make sure you have the minimum required version of WYSIWYG Web Builder. 2) Make sure you have the latest version of the extension(s). And only download the files from our website! However if you change the default document folder in Menu->Options->Tools->Files & Folder->System Folder then the folder for extensions will also change! Note that you do not have to load the extensions manually, they will automatically be detected by the software! If not, then please carefully read the instructions again. Last edited by Pablo on Sun Jun 27, 2010 9:23 am, edited 1 time in total. But you can also use the Extension Manager. Re: How to trouble shoot Web Builder Extension issues? If you manually install extensions (by copying them to the extension folder) then you may need to reset the toolbox. Right click the toolbox and select "Reset toolbox' or use 'Customize' to drag & drop the newly installed extensions to the toolbox. If you experience problems with loading extension then make sure you did not install more than 200. Also make sure the extension was designed for the version of Web Builder you are using (see the documentation of the extension). When you have startup problems (slow loading) or pages are unstable it may be caused by an outdated or corrupt extension. The quickest way to find out if an the problem is related to one (or more) extensions(s) is by temporarily disable them. If that solves the problem then the next step if to find out which one of the extensions is causing trouble. You can do this by moving extensions (.wbx and .uwbx files) to another folder one by one until it works. If you have copied the documents folder (including extensions) from a backup then the folder may have the wrong permissions/credentials, so WWB cannot access the files. 3. Rename the folder, for example to 'extensions_old'. 5. Close the applications again. 6. Copy the extensions from 'extensions_old' to 'extensions'.